A week-long trekking holiday into the beautiful high mountain scenery of the Picos de Europa National Park. Explore the area in depth with walks in the unspoilt and wild landscapes of the western, central and eastern massifs. Arrive into Bilbao Airport and drive to our hotel in Sotres. Sotres is the highest village in the Picos, situated between the central and eastern massif and within the designated Biosphere Reserve. It is an ideal base for exploring the spectacular mountain landscape. We start our day with a short transfer to El Collado de la Caballar (1,100m), the starting point for today's walk. We start with a gentle descent to Tobaos Majada (900m) then start our ascent to Collado de Pasadoir (1,215m). We follow the ridge through the pastures of Portudera,Todrin and Tambrin with some spectacular views (weather permitting) along the ridge of all three massifs before we start our descent to the outskirts of the Arenas de Cabrales - here we join and follow an original cobbled roman road for one and a half kilometres, returning to Sotres for the night. Today's 17 kilometre walk is expected to take around seven hours with approximately 350 metres of ascent and 550 metres of descent. This morning we drive the short distance down to the collection of red-roofed buildings known as Invernales de Cabao and cross the river. Then, ascending along a series of switch-backs, we gain height quickly to reach a viewpoint looking back towards Sotres. The track levels out now, ascending more gradually onto a plateau. Here stands the tiny hamlet of Pandebano, where, in AD718, a battle took place between the Visigothic Christians and the remnants of a somewhat depleted Moorish army. Leaving our vehicle, we walk up to a 'saddle', where the huge monolith of the Naranjo de Bulnes (Pico Urriellu 2,519m) comes into view. Rearing straight up from the surrounding rockscape, this rust-coloured mountain is the famous iconic image of the Picos. We walk up to the base where there is a refuge and the chance to see climbers attempting to scale the improbable sheer face. Today's 16 kilometre walk is expected to take around six-and-a-half hours with 800 metres of descent. Day 4 - Hike through beech forest to Treviso. Drive to the medieval town of Potes. We start this morning with a short drive to Jito de Escarandi from where we start our walk at 1,395m. We follow an old shepherds' paths down through the Valdediezma beech forest and pastures to Sobra Valley and up to Treviso where we will stop for a lunch break en route. After lunch we will continue down the Balcon de Pilatos to Urdon where we will meet our bus to take us on to Potes where we stay for the night. The medieval town of Potes centres around the river with stone bridges, cobbled streets and historical buildings. Today's 10 kilometre walk is expected to take around five hours with 1,150 metres of descent. Day 5 - Take the spectacular Fuente De Cable Car, walk down into the Aliva valley. Today we drive to Fuente Dé making a visit to the Santo Toribio de Liebana Monastery on the way. We take the cable car up 1,000 metres to the rugged high plateaux of the Picos to be greeted with panoramic views of the national park. We walk through alpine meadows down the Aliva glacial valley to Sotres, stopping for a picnic lunch and to see the abandoned Las Manforas mines. Today's 18 kilometre walk is expected to take around five hours with 100 metres of ascent and 1,000 metres of descent. Today we drive down through Alpine scenery to Puente Poncebos at 218 metres. Here the medieval pack horse bridge spans the Cares river. This marks the starting point for the walk through the dramatic gorge of the Garganta del Cares - a cleft over 1000 m deep and some 12 km long. The path literally cuts into the cliffs in places; only with the aid of tunnels and bridges is it possible to traverse its entire length. 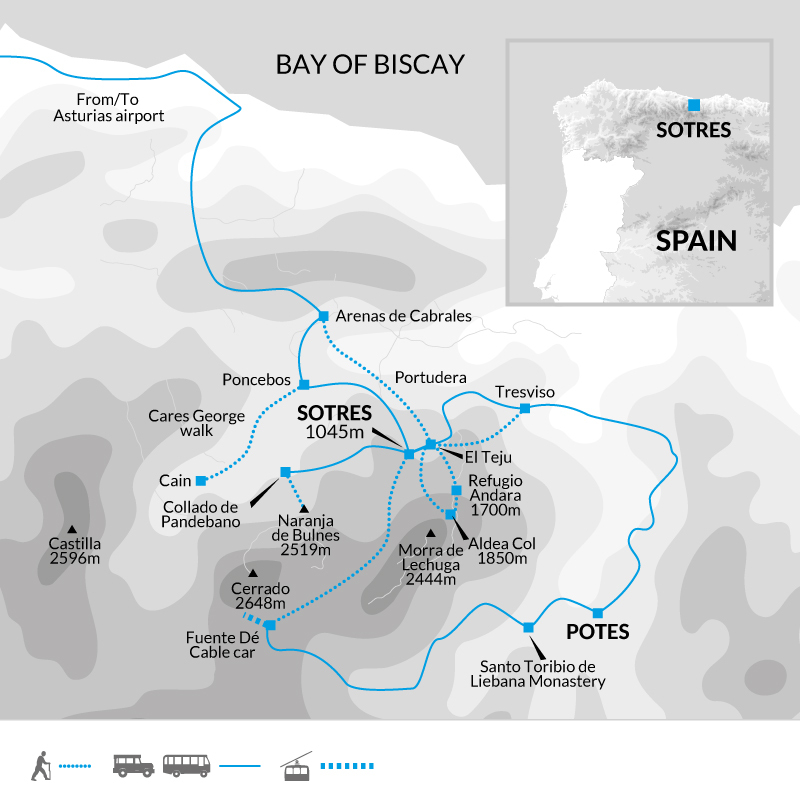 This is one of the highlights of any visit to northern Spain and is a six hour round trip on foot, although walkers can turn back at any point and return to Poncebos where there are places to eat and drink if you wish before we return by vehicle to Sotres for a well-earned rest. Todays 24 kilometre walk is expected to take around six hours with with 300 metres of ascent and descent. We return to Jito de Escarandi for the start of our walk to the Caseton Refuge (1,225m) via Trasmacondiu Col (1,850m) and the Andara Vegas pastures. From the Col we descend around Macondiu mountain (summit 2,050m) to the refuge for lunch, then continue back to Jito de Escarandi (1,300m) where the minibus will be waiting to return us to Sotres. We will arrange a transfer back to the hotel or you may choose to walk the final 30 minutes back to Sotres. Todays 12 kilometre walk is expected to take around four and half hours with with 150 metres of ascent and 550 metres of descent. We depart from the hotel around 11:30 taking in the mountain scenery a final time en route to the airport, where our trip ends. Plastic Bags - If you pack bits and pieces in plastic bags inside your day sack they will stay dry in case of rain. Situated in the heart of the region's highest village of Sotres, Casa Cipriano is a small family-run hotel perfectly located as a base for exploring the spectacular and little known Picos de Europa mountain range in the heart of northern Spain's Asturias region. A walk through the village leads to a viewpoint of the surrounding peaks. The hotel features a bar as well as a restaurant serving home cooked food - not to be missed is the traditional and very delicious La Fabada Asturiana, a hearty soup made with beans, chorizo and black pudding. In winter an open log fire makes for a comfy nook in the bar, whilst in summer the terrace outside is a popular spot for guests and locals alike. Next door the family also runs a small shop, selling everything from small locally made souvenirs to cheeses and cured hams. Rooms are simple yet cosy and feature tiled floors, wooden furniture and an en suite bathroom with a shower over a small bath tub. Central heating during the winter ensures a comfortable stay. There is a TV and hairdryer in all rooms. Walks on 6 days for between 4.5 to 7 hours on mountain paths. 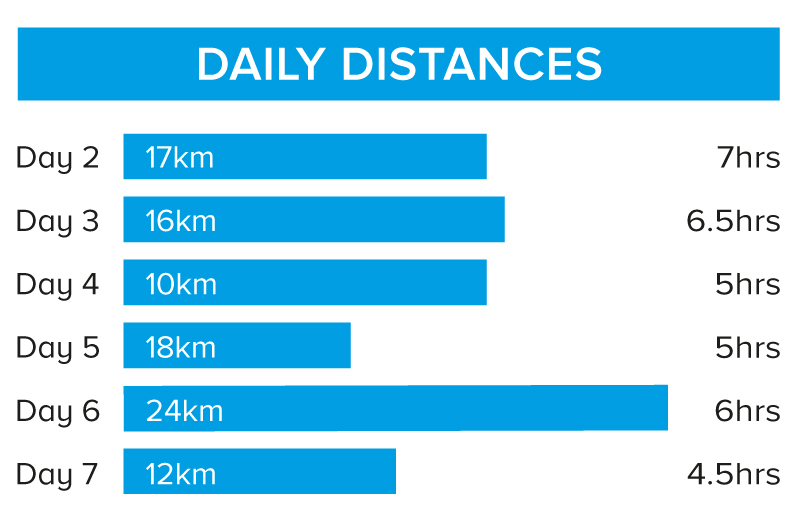 Significant ascent and descent on most days, over 1,000m descent on days 5 and 6. The trails are good and well-defined with some scree. Situated in the heart of the region's highest village of Sotres, Casa Cipriano is a small family-run hotel perfectly located as a base for exploring the spectacular and little known Picos de Europa mountain range in the heart of northern Spain's Asturias region. A walk through the village leads to a viewpoint of the surrounding peaks. In the evenings relax in the cosy hotel bar and enjoy JuanJo and Sonia's hearty homemade food - on most days breakfast, a picnic lunch and dinner are provided. Learn about the culture of the shepherds of the Picos de Europa and the traditional way of making cheese, tasting at the local restaurants.